Week Eighteen: 100% Whole Grain Breads Hot Browns! Research pays off. Don’t let anyone tell you any different. I know this for a fact, because this week, I have made the best whole grain breads I’ve ever attempted. This was not the result of a happy accident, no. I studied, I pored over books and websites, I thought long and hard. And when I finally mixed, baked, and tasted the fruits of my labors, I was over the moon. I have saved the best for last; for today is Derby Day! As all my dear friends and family in Kentucky know (and dread, for the ones in the service industry in Louisville), today is the 135th Run For The Roses, the most exciting 2 minutes in sports. I’m not going to let this by without comment, so I’m showcasing today’s absolutely delicious bread as the base for a most Kentuckian food, the Hot Brown. 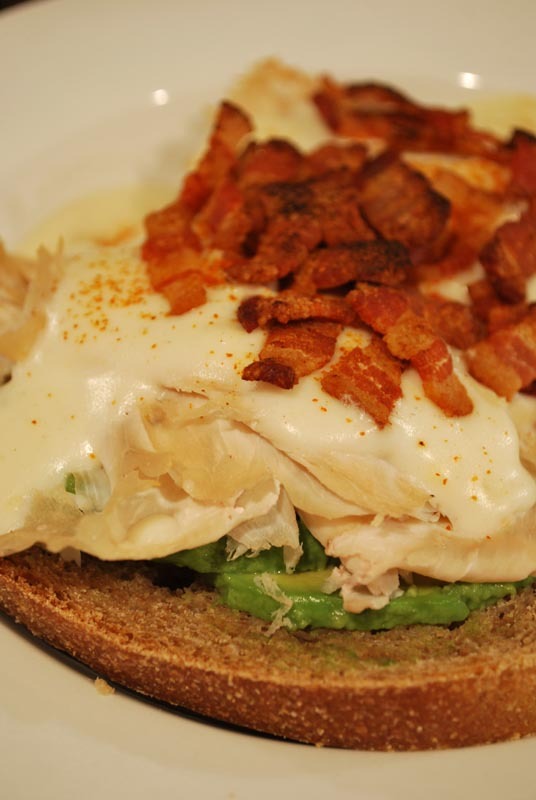 A hot brown, for those who aren’t familiar, is an open-faced sandwich, topped with thinly sliced turkey, topped with a parmesan Mornay sauce, broiled until bubbly and warm, and garnished with bacon. You will find people that argue for and against the inclusion of tomato, but I think that’s a personal preference. Me, some days I like them, some days I don’t. Some people also include mushrooms on their hot browns, which I find delicious, but a bit non-traditional; so I’m on the fence with that one. If you have sharp eyes, you may notice in the above picture that I included avocado with mine today, a decidedly inauthentic ingredient, but a most delicious one. It’s a sandwich; let’s not get all huffy about details here. The hot brown was first made around 1923 at the Brown Hotel, which is still open today in Louisville. The sandwich became an instant hit, and soon spread all across the state. Today, you will find many variations, including a “Veggie Brown” for vegetarians, and one called a “Not Brown”, made with crab, shrimp, and fried green tomatoes, from one of the Brown Hotel’s head chefs, John Castro. But no matter what variation you end up with, they all depend on the same base: a good slice of sandwich bread. No crusty baguette will do here, since the dish requires the use of a knife and fork, and such a hard crust would just be difficult to cut with a standard table knife. No, you need a soft crust here, but on a bread that won’t simply squish and dissolve under the toppings. You’ll find most hot brown recipes call for white bread, but I think the sturdiness of a piece of wheat bread is most welcome here. But no typically sawdusty grocery store bread will do; for the base of a great sandwich, you need a great bread. 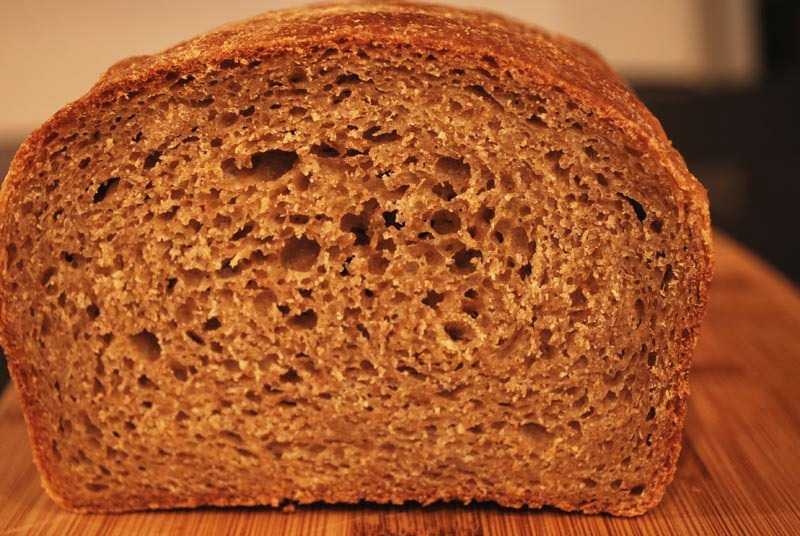 And this bread is not only great, it might just be the best whole wheat bread I’ve ever made. They key (aside from grinding your own flour from store-bought wheatberries; which I did not do, not having a wheat grinder) is mainly to not let the bread rise too much. As opposed to a standard white flour bread, where one lets the bread at least double in size, here you don’t want it to rise over 1 1/2 times in size. This is because of the bran in the wheat flour – remember, it acts like tiny scissors in the dough – which will actually destroy the gluten as it forms. Rather un-intuitively, by keeping the level of rising down, you preserve gluten, which in turn makes for a fluffier bread later (since it’s the gluten that holds in air released by the yeast). I know, it seems like you need to let it rise more, but just trust me on this one. Oh, and the other main trick to this bread is the use of vital wheat gluten. Made from running water over wheat flour, the carbohydrates are washed away, and only the protein-rich gluten remains (magically). Adding this to whole wheat bread enhances the gluten formation, usually somewhat lacking (because of the aforementioned bran). Between the limited rising and the vital wheat gluten, you end up with something as fluffy and light as the best store-bought bread; but you also end up with something far more nutritious, due to the lack of dough conditioners, preservatives, and what-have-you. I know, it seems like quite a lot of trouble for a loaf of bread you can “get down at the corner store”. But if you can find a loaf of 100% whole wheat bread as moist, airy, and flavorful as this one down at your corner store, then you’ll have to let me know where the heck you shop. This is a truly special bread, and one that I’m proud to serve as the base of my Old Kentucky Hot Browns. Enjoy! 1. In the bowl of a stand mixer, combine the water, honey, 10 ounces of the flour (about 2 cups), and half the yeast. Using the whisk attachment, mix for about 3 minutes, or until very smooth, scraping the bowl as necessary. Remove the bowl from the mixer. 2. Whisk together the remaining flour, the vital wheat gluten, and the remaining yeast. Sprinkle it over the mixture in the mixing bowl, forming a thick coating of flour. Cover tightly with plastic wrap, and let stand at room temperature at least 1 hour, and up to 4 hours. The sponge should start breaking through the flour covering after about 1 1/2 hours. 3. Using the dough hook, mix on low speed until a shaggy dough forms, about 1 minute. Scrape down any errant pieces of dough on the sides of the bowl. Cover with plastic wrap, and let rest for 15 to 20 minutes. 4. Mixing at low speed, add the oil in a slow drizzle, letting it absorb before adding more. When the oil is mostly integrated, add the salt (which will help any excess oil absorb into the dough). Knead the dough for a total of 7 to 8 minutes. The dough will be fairly sticky, and will not form a cohesive ball. 5. Transfer the dough to a lightly-oiled bowl. Lightly spray or brush the top of the dough with additional oil. Cover tightly with plastic wrap, and allow the dough to rise at room temperature for about 1 hour, or until 1 1/2 times bigger in size (no more, or the gluten will tear). 6. Scrape the dough out onto a floured surface, and dust the top with flour. Press the dough into a flat shape, deflating it. Tri-fold the dough, as you would a letter, and return it to the bowl, seam-side down. Brush or spray the top with oil again, cover with plastic wrap, and let rise another 45 minutes, or until 1 1/2 times bigger in size. 7. Butter or oil a 9 x 5 loaf pan. Turn the dough out onto a lightly floured surface, and press gently with floured hands to flatten it a little. Roll and press the dough into a loaf shape, using as little flour as necessary to prevent sticking, and transfer carefully to the prepared pan, seam-side down. Cover with lightly oiled plastic wrap, and let rise at room temperature for about 45 minutes. The dough is ready when pressed gently on the edge with a fingertip, the depression fills in very slowly. Preheat the oven to 450° F.
8. Spray or sprinkle the risen loaf with water, quickly place in the hot oven, and reduce the temperature to 400° F. Bake for about 45 minutes, or until golden brown and baked through (an instant-read thermometer should register about 200° F when inserted into the middle). Remove from the pan and let cool completely on a rack. 1. After folding the dough in step 6, you can refrigerate it overnight if you like. Bring the dough to room temperature (for about 1 hour) before proceeding with the recipe. 1. Make mornay sauce: melt butter over medium heat in a small saucepan. When melted, add the flour, and stir until fully coated. Continue stirring over medium heat until the mixture begins to brown, and a nutty smell emanates. 2. Add 1/3 of the milk, whisking to prevent lumps. When smooth, whisk in the remaining milk. Cook over medium heat until slightly thickened, adding more milk if necessary to thin. 3. Add the grated parmesan cheese, and stir until melted and smooth. Stir in the nutmeg, white pepper, and salt to taste. Adjust seasoning as necessary. Let cool slightly. Preheat the broiler to high. 4. In each of 4 oven-safe plates, place two slices of bread. Top each with an even amount of sliced turkey. Spoon mornay sauce to taste over each, and top with a dusting of paprika or cayenne pepper. 5. Place plates about 4 inches from broiler and cook until bubbly, about 1 to 2 minutes. Remove from oven, top with bacon (place in the traditional “X” if using whole slices), and serve warm. 1. If you like, you can top the sliced turkey (in step 4) with sliced tomatoes, sautéed mushrooms, sliced avocado, or what have you. Top with mornay sauce, and proceed as directed. 2. A mint julep would not be out of place next to this sandwich, but a lovely rosé would be just as nice, as would a good beer. This really is the best 100% whole wheat bread. It may seem a bit fussy with several risings, but it’s well worth it. Very delicious! Next time I will try the overnight cold ferment, although I can’t imagine it getting even better! Thanks for the great tips. Oh yes, this one is a winner! Maybe I shouldn’t admit it, but I’m still hoarding a few precious slices in the depths of my freezer. You know, for emergencies. Good luck with the experimenting, and happy baking!